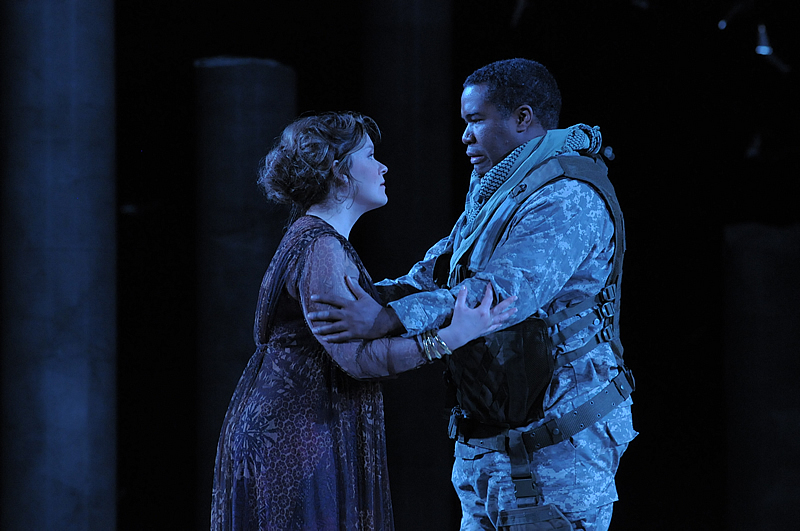 Peter Sellars returns to direct a dream cast in his acclaimed production of Handel’s timeless and poignant tragedy. The ancient Greek tragedian Sophocles was also a war general who knew first-hand the devastating psychological traumas that imperilled returning veterans. 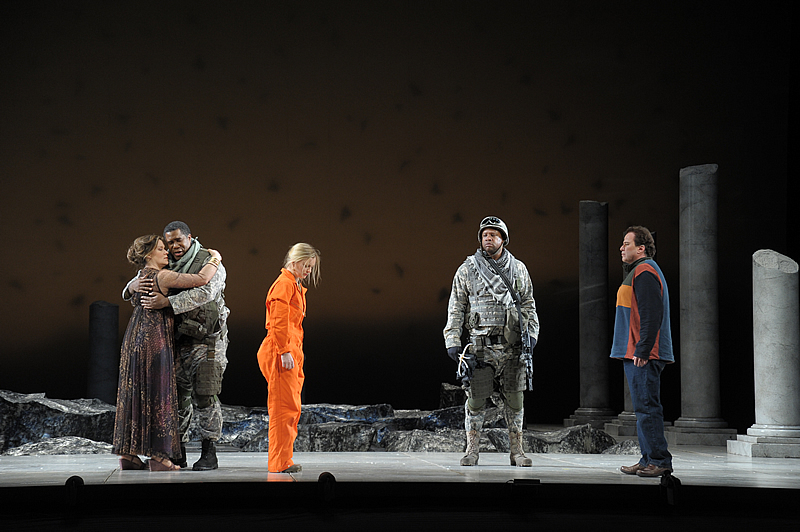 With Hercules – Handel’s take on Sophocles’ play – Sellars creates a healing work in which the untold horrors of war and the unspoken complications of reunion find their voice. On stage at the Four Seasons Centre, 145 Queen St. W., Toronto. Performance time is approximately three hours, 15 minutes including one intermission. Sung in English with English SURTITLES™. In Hercules’ palace, Dejanira waits for news of her husband Hercules, the world’s strongest man, who has been away at war. Dejanira fears he will never return. Their son Hyllus reports the priests have prophesized his father’s imminent death, with a vision of Hercules’ corpse surrounded by flames. Hyllus swears to travel to the ends of the earth to find his father. At that moment, the herald Lichas announces Hercules is alive, having conquered Oechalia, and is on his way home. He brings with him prisoners, including the lovely princess Iole as a war trophy. Iole and her virgin attendants are led in, mourning their loss of liberty. 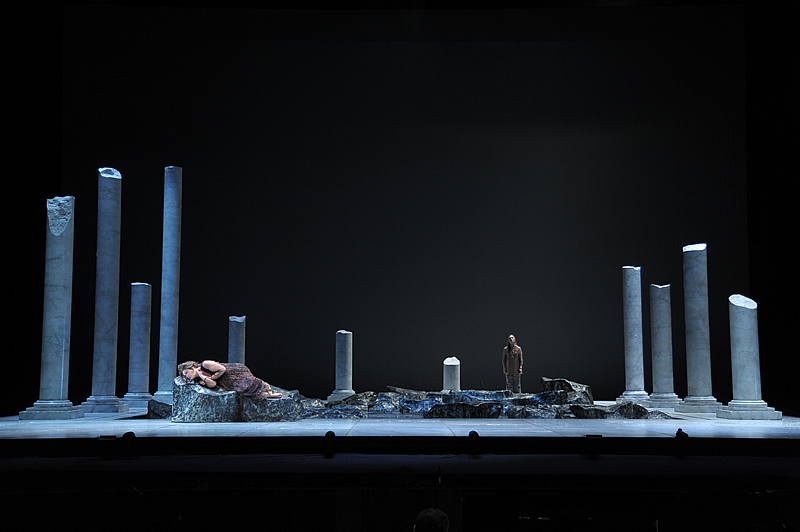 Iole bewails the death of her father at Hercules’ hands, which contrasts sharply with the jubilant celebration of the hero. Back in the palace, Dejanira admits she is threatened by Iole, fearing that sorrow makes beautiful women irresistible. With little evidence, she believes Hercules has betrayed her with Iole. Iole denies it. 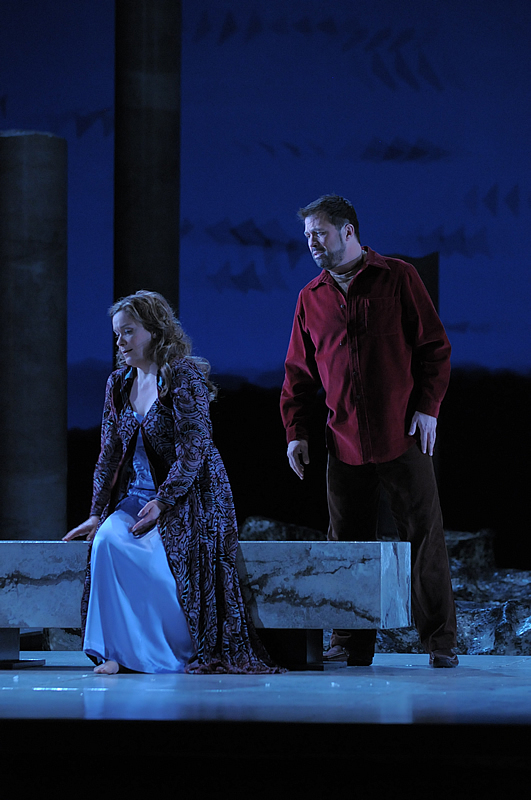 Hyllus – who has fallen in love with the captive princess – tries to convince Iole to return his feelings, but she refuses his advances, saying she cannot love the son of the man who killed her father and destroyed her homeland. Meanwhile, Dejanira confronts Hercules, chastising him for trading the glory of victory for the shame of infidelity. Hercules denies any wrongdoing, but this does little to allay Dejanira’s suspicions. Suddenly, Dejanira remembers a vest given to her years before by the centaur Nessus, after he suffered a fatal poison arrow fired by Hercules. The blood-soaked garment is said to “revive the expiring flame of love.” With hope of rekindling their passion, Dejanira gives the vest to Lichas and asks him to deliver the peace offering to her husband. Iole enters, and Dejanira apologizes for her earlier jealousy. Iole expresses happiness for the royal couple’s love and “sorrow at her own predicament,” and Dejanira promises to do what she can to secure the princess’s release. A violent and intense overture makes it clear that all is not well. Lichas tells the Trachinians of the terrible events he has just witnessed – the coat has fatally burnt Hercules’s flesh. His death is inevitable. 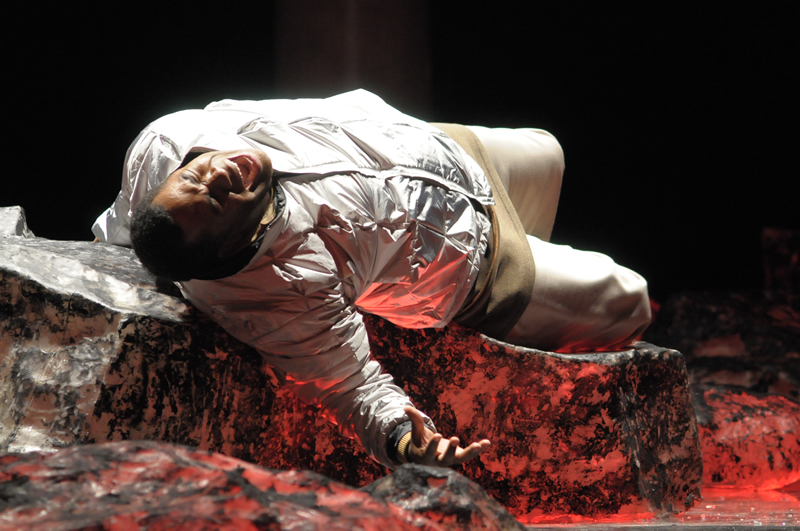 Railing against Dejanira for causing his demise, Hercules asks Hyllus to burn his body on a funeral pyre atop Mount Oeta. At the palace, Dejanira’s realization that she has unwittingly carried out Nessus’s revenge torments her, and she teeters on the brink of insanity. Iole pities the woes of the couple, as she decides that she is the guilty cause. A priest then tells Dejanira that an eagle has transported Hercules’ spirit to Olympus, to join the gods for eternity. The priest also announces that the gods have declared Iole and Hyllus destined for each other. The two pledge their love, and the priest and chorus praise Hercules for bringing peace and liberty to all. George Frideric Handel, born in Halle, Prussia, on Feb. 23, 1685, was discouraged by his parents from studying music as a boy. Luckily, his father’s employer the Duke of Saxe-Weissenfels heard young Handel playing the organ and persuaded his parents to let him have a musical education. In 1702 Handel became the organist at the Calvinist Cathedral of Halle. It is believed that he visited Berlin at that time, where he met Giovanni Bononcini and Attilio Ariosti and developed an interest in composing operas. In 1703 Handel went to the opera house in Hamburg as second violinist. The resident composer Reinhard Keiser had to leave town quickly owing to large debts. He left an opera unproduced and when Handel was asked to set the same libretto to new music, he had his first production in 1704 of Almira, which was highly successful. Ferdinando de’ Medici encouraged Handel to travel to Florence to familiarize himself with the Italian style. There he composed operas and church music (including the oratorio La resurrezione) and had his music performed in Florence, Naples, Rome and Venice, all the while perfecting his ability to set Italian words to music. His opera Agrippina opened the 1709 carnival and was a huge success. In 1710 he took the position of Kapellmeister to the elector of Hanover (and future King George II of England). Handel traveled to England in 1710, a time when London audiences were clamouring for Italian opera. Until then, the productions that had been mounted were adaptations of Italian operas, many of these versions arranged by Nicola Haym. Handel was to present the first real Italian opera written for London and performed by Italians (the castrati were especially favoured by audiences): Rinaldo premiered in 1711 and was a sensation. In 1713 Handel was released from his employment in Hanover, possibly because he had expressed a desire to settle in London. He composed more operas to mixed success but was also writing church music as well, including Te Deum (1713) and Jubilate (1714), the latter of which had its first performance for the new king, the former elector of Hanover. For his music for the church and the court, Handel was awarded a pension. 1717 saw the premiere of his Water Music. That same year he took a position with the Earl of Carnarvon (soon to be Duke of Chandos) in London where he wrote 11 anthems and two dramatic works, Acis and Galatea and Esther. In 1719 Handel was appointed the musical director of the newly founded Royal Academy of Music, for which he wrote a dazzling series of operas: Rodelinda, Giulio Cesare, Giulio Ottone, and Admeto, ending when the Academy closed in 1728 due to lack of funds. In 1723 Handel took British naturalization. Beginning in 1729 he launched a series of opera seasons at the King’s Theatre. Works included Acis and Galatea, Orlando, Ariodante and Alcina. In 1741 Messiah was premiered in Dublin and Handel stopped composing operas. From then, his work was taken up with oratorios, (including Semele, Samson, Belshazar and Judas Maccabaeus), orchestral works (including the Concerto grosso, Op. 6, 1740) and revivals of his many operas. When Handel died in London on April 14, 1759, he was buried in Westminster Abbey. He was, and is still acclaimed as, a supreme artist of the Baroque era. His powerful, beautiful and vividly dramatic music is shown in all his works, including the English oratorio, a genre he created. This entry was posted in Music, OPera and tagged Canadian Opera Company, England, George Frideric Handel, Handel, Hercules, Iole, London, Lyric Opera of Chicago, Mount Oeta, Toronto. Bookmark the permalink.